Son Chhay speaks to journalists outside T&P Co Ltd last week in Phnom Penh’s Sen Sok district. The opposition Sam Rainsy Party issued a letter on Wednesday to Malaysia’s ambassador to Cambodia, requesting the embassy alert its government to the alleged activities of T&P Co Ltd, a labour recruitment agency accused of imprisoning its trainees. 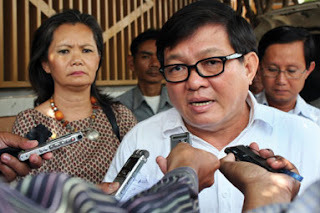 Opposition lawmaker Son Chhay wrote the letter – which details the accusations levelled against the company, in addition to the SRP’s investigations earlier this week – after receiving information that T&P had sent some of its trainees to Malaysia. “We hope that your Embassy will … help in preventing these violations of human rights by informing your government as well as [raising] this situation with the Cambodian government so that a very close monitoring system can be set up in order to stop all forms of exploitation and abuses of the workers,” the letter read. Deputy Head of Mission Raja Saiful Ridzuwan confirmed that the Malaysian embassy received the letter yesterday and said the embassy would issue a response within the next couple days. He said he briefly discussed the letter’s contents with Malaysian Ambassador Datuk Pengiran Hj Mohd Hussein Datuk Pengiran Hj Mohd Tahir Nasruddin. The T&P recruitment agency has come under scrutiny since the death of a 35-year-old trainee in the company’s offices earlier this month. Several trainees have said they were denied leaves of absence from the company’s headquarters, including a 31-year-old trainee who broke both legs while trying to escape. Son Chhay said yesterday that both countries’ governments had a responsibility to migrant workers, given the raft of human rights abuses that Cambodian workers have faced in Malaysia. Ridzuwan said the embassy had no responsibility in domestic matters, such as investigations into T&P. Ridzuwan said he believed “some workers” had been sent. to Malaysia by T&P.